Municipal authorities demolishing a night shelter meant for the homeless in the national capital may be a one-off incident, but winter has always been an annual disaster for thousands of those having no roof over their heads. Adjusting to their dirty and undersized blankets, scores of homeless people squatting under flyovers, pavements and at market sides is a very common sight during these winter months. Many become victims of the harsh weather, while others struggle through the season, which activists call a disaster. "In a country like India, winters are much more a disaster than floods and earthquakes as more people die or suffer during this time," said Anshu Gupta of Goonj, a non-governmental organisation which distributes warm clothes to the needy during winters. "The winter crisis hits the homeless every year, but still it is neglected and the authorities caught unprepared every time. This is pathetic," said Gupta. Image: A homeless woman sits near a main road in New Delhi. Sanjay Kumar of Ashray Adhikar Abhiyan, an NGO under ActionAid India working for the homeless, said the government should have a contingency plan to meet this crisis which occurs every year. "The homeless have a right to shelter, right to life, right to livelihood. The Reserve Bank of India's guidelines make financial provision for weaker sections of society, but this does not include the homeless. The state is accountable to everyone," Kumar said. 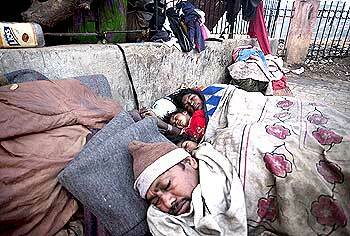 According to the Delhi Development Authority, at least one per cent of the capital's 14 million population is homeless. This means that no less than 1,40,000 people live on Delhi's streets. 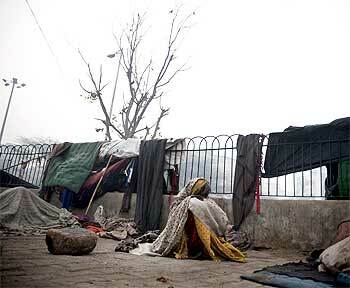 Lack of shelter and clothes are the two major problems of the underprivileged during the winter, say activists. There are 30 night shelters across the city that can provide accommodation to only 4,000 homeless. "Only a few fortunate get accommodated in those shelters, which is less than three per cent of the total homeless people on the streets," said Kumar of the AAA, which manages most of the shelters run by the MCD. 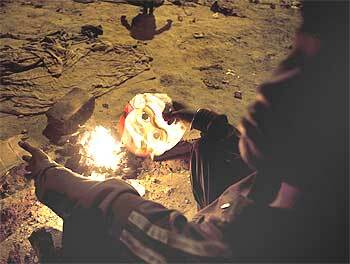 Image: A boy burns a Santa Claus mask to warm himself. Meanwhile, MCD officials admit that the efforts towards providing shelters to the homeless have never been adequate and blamed it on the lack of manpower and infrastructure. "We are not equipped to run shelters for the homeless population. We don't have the infrastructure to cope," said a senior MCD official. Recently, the MCD had demolished a night shelter in Pusa road and received a severe reprimand from the Delhi high court for that. Chief Minister Sheila Dikshit also visited some night shelters last week and assured more help to the needy. The activists, however, blamed the government for not being serious towards this 'recurring plight' of the homeless. "It is not a very big deal for the government to arrange tents for the homeless for two to three months. There is a cluster of such people around industrial places, so the government should arrange for this beforehand," Gupta said. 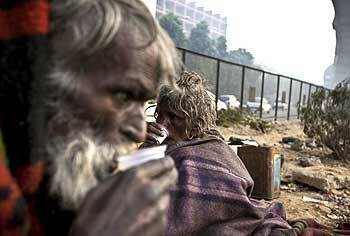 Image: Homeless people sleep on a chilly morning in Delhi. Mahesh Sharma, deputy director of the Social Welfare Department, admitted that the problem is very serious, but disagreed that the government is not doing anything to address the problem. "It is not correct to say that government is silent on this issue. We have been coordinating with the agencies involved in relief and rehabilitation work for the homeless," he said, adding that the government is ready to put up more night shelters if NGOs come forward to manage them. "Besides, we also provide clothes to the needy through NGOs and other nodal agencies," he added. Currently, a few NGOs like Goonj have been supplying warm clothes to the homeless across the country. In association with the Rotary Club of Delhi, Godrej has also been organising a winter wear donation campaign for some years under its Ezee Raahat Ek Abhiyan initiative. Image: A man enjoys a cup of tea on the streets of Delhi.